Looking at the photo from Eddie Ross’ visit made me aware of something. Well no it didn’t, really. An email from a friend opened my eyes in the end. He pointed out that whilst I looked dashing, I was overdressed. True. I was the only man at the event in a suit and certainly the only man within miles to wear a collar pin. I tend to overdress. I think it’s what that fellow pictured above would do. Suits and black shoes for evening events are really the only things that I consider when contemplating my wardrobe before dashing out the door. Unless it’s a casual dinner amongst friends. And then I still might throw on a sportcoat and odd trousers. And if the invitation states “Black tie optional”, I always wear a dinner jacket. Dressing up is just as easy as dressing down and far more elegant. But I do look out of place on occasion. What about you? Any hard and fast rules about what you wear and when? 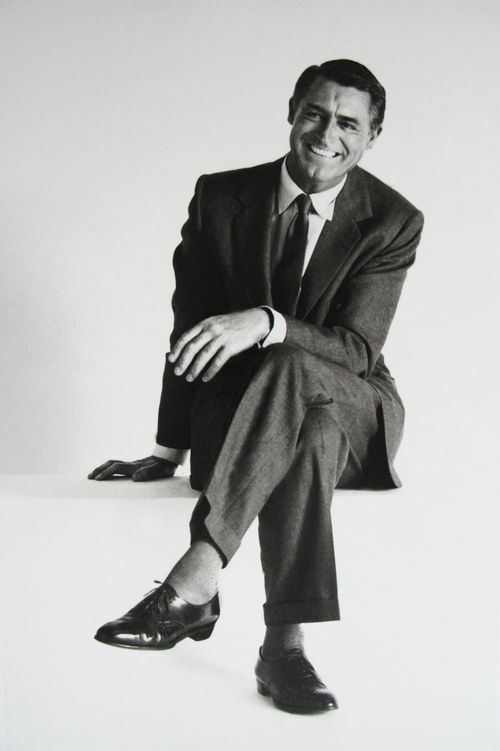 This entry was posted in Elegantology and tagged Cary Grant, Collar pins, Eddie Ross, The Errant Aesthete. Bookmark the permalink. 28 Responses to That’s My Story and I’m Sticking to It. I can’t agree more! It is as easy to put on a nice pair of trousers, a decent sweater, and some accessories as it is to throw on a pair of sweats and a t-shirt. I keep wanting to do a series of pix for my food blog about people who just rolled out of bed and went to the farmers’ market. If people knew how ghastly they look, I hope they’d be shocked into making an effort. My #1 rule is: You can never be over dressed…but if you show up under dressed you run the risk of feeling awkard and/or out of place. What is the harm in dressing up? If the slobs of the world feel that you are showing them up, so be it. Frankly, I blame women. A few well placed, “you look like hell”, by the softer side would clean the world up quickly. Life’s too short. Wear the lovely clothes if you’re lucky enough to have them. I am always enchanted by anyone who has made an effort to dress well. It shows respect and balls. I always overdress – I would rather be known for being well dressed than looking like a slob! No one gets a second chance to make a first impression! I never tire of looking at that man. And Amen to those in life who bring thought, style, and sartorial splendor to any and all occasion. Lord knows we’re the better for it. And a most grateful thank you. I’m always happy to be in your esteemed company. for a fresh-out-of-college-trying-to-achieve-independence person such as myself I haven’t been able to justify putting down the cash for a three piece dinner suit and black bow tie (severely overpriced these days) but always make sure to dress the best I can for the occasion. if there’s any doubt as to what is appropriate I take coco chanel’s advice, “when in doubt, overdress”, and go just a little bit further than could possibly be required. armod, don’t underestimate vintage. I wore nothing but vintage dinner jackets for years both in school and after. I picked up my full set of 1940’s tails for less than $100. 3) ME. Really, I am not kidding – I am my harshest critic and my most ardent supporter. And, frankly, much to my chagrin, I am surrounded by only a small number of people who have the sensitivity to respond to my eccentricities. So, each day I try to meet my own sartorial bar… And, to be honest, so outfits are OTOs…. (one time only) ’cause it just didn’t grow on me. If I were expecting you for a party (or even just to stop by for a chat), I would expect that you’d be well-dressed no matter what. With those other fellows, you stood out IN A GOOD WAY. Smashing! I get a lot of crap at work, (even picked on a bit) for being from Connecticut and dressing Ivy League (or preppy according to them – but I’m not preppy). I like traditional clothing – dress and casual. I really don’t care what the other guys say or think about my clothes, I know I get more compliments than they do, not that I’m looking for any. Don’t change – be you, and dress the way you like. You have fans here you know. I also tend to overdress. I’m wearing ties more often at my office than most other people wear dress shirts. However, sometimes I start laughing at myself, putting on odd trousers and sports coat for a cup of coffee or two on a sunday afternoon. Seems a little… well, overdressy. However it’s gotten to a level where I’m uncomfortable unless I’m wearing a jacket, be it tweed, super 120 wool or cotton. And for that reason, I’m doing my best to tone it down a little. When all comes around, I’m still just 25. Hello All and thank you for your votes of confidence. I don’t plan to change. Like Joacim, I’m most comfortable dressed. Especially at 43 years of age. But I do think there’s a happy medium that I mean to explore. For example, Grant dressed down his suits with button down collars and casual tailoring as did Astaire. Don’t forget that my idea of dressed down is far different from the average man’s. Paul, yes people seem to have forgotten what “preppy” style really is. Ex-B Jon, point 3 is well taken and understoood here at the manse. I work from home and still dress. EA, it is I who am honoured to be recognized. P-D, we all have to meet up soon. Kindred spirits and all. SP, Elizabeth and Taylor. Amen. Keep fighting the good fight. I’ve got your backs. Much of what you ask is geographic. What plays well in Seattle may not in Charleston. The idea is to be eversoslightly better dressed than anyone else in the room, no? Taking the location into the equation, I’d try to set things up so that the removal of a tie, the opening of a button or taking off and slinging the odd coat over the shoulder would take any hint of ‘overdressing’ off the table. Don’t forget, one doesn’t want to feel uncomfortable in one’s setting, but more importantly, one doesn’t want to make others to feel uncomfortable in their clothing…. I so disagree with your friend that you are overdressed. I absolutely hate being asked, “Why did you wear a tie,” or “Why are you so dressed up?” I was taught that it was bad form to make any sort of comment, good or negative, regarding someone’s appearance. But since this is the topic of discussion here, I will say this. I think you look super, and your faithful readers agree with me. The eyeglass frames are an excellent shape and proportion. Haircut is perfect. I personally think of pinstripes as more day/ business, and prefer solids such as charcoal or navy for evening and more formal daytime events such as weddings or daytime receptions at an embassy. You don’t look overdressed, but everyone else looks inappropriately dressed. Since when do a tennis sweater, short sleeves, and distressed jeans look right for a pre-holiday evening party? Another outfit looks like what the newsboy wore in a 1930s Cagney gangster movie. It is costume. The thing is, people don’t remotely have a clue as to what to wear anymore, what looks flattering or elegant, and that is why we desperately need “Easy, Elegant Life,” and “What Not to Wear.” But it is a bit like preaching to the converted, I suppose. Nonetheless we love the outfits on our dear Elegantologist, and hope that somebody will be inspired and invite us to their next soiree, where we can also wear the things we know look best. Cary had it sooo right. Van Day Truex had an almost identical sense of classic, effortless, appropriate style. A button down Oxford cloth shirt with a solid suit, or Cary’s look as illustrated, would have been the ideal look for the men at such an evening holiday party in these more casual times. So many people think they’re being individual and creative when they throw disparate, very casual elements of dress together. No. They just look slovenly and wrong. . Don’t you hate it when you’re wearing a beautiful suit at the theatre or symphony, and the guy beside you has dirty, over designed athletic shoes? I am reminded of a situation when one co-worker, who always made disparaging comments about me wearing a tie, came to me in June to ask how to knot a necktie so his son could wear one when he graduated. In life there are times when a man should wear a jacket and tie. I’m so glad you stick to your guns; in these times it shows originality, sense of personal identity, and an intelligent sense of what is right and correct. NIce that you mention Van Day Truex. Brilliant on all fronts. A few hard and fast rules for dress . . . dress your age; press your clothes; own and use a lint brush; be willing to spend a little time and money to organize your wardrobe–it takes both, but doesn’t have to break the bank. Wear natural fabrics–try not to go overboard on anything with stretch in it. I’m usually overdressed too as were/are my kids. The thing is, years ago we would have been the norm. Now the norm is to go out of the house in pj bottoms and plastic shoes meant for gardening and consider yourself ‘dressed’. While Sedaris is referring to American tourists abroad, his statement applies to anyone leaving the house, and speaks to the lack of courtesy shown by sloppy dressing. I am overdressed at work because it is so casual now. I also like to see others dressed elegantly and all pulled together. Life is too short. wear your best clothes, use you fine china and silver and cloth napkins! What are we waiting for! Il vaut mieux faire envie que pitié !!!! Original comment became so long I had to turn it into a blog post. If you cannot dress simply because you understand the pleasures and benefits of dressing, then when will you ever have the chance? I work in an office where the president of the company routinely shows up in jeans and a t-shirt. It’s a shabby society. I don’t dress anywhere near where all of you are yet because I am new to it and have just started building a wardrobe and educating myself. (Color coordinating I find daunting) But I still receive “what are you dressed for?” comments every day. I just say I have joined a sartorial rebellion that seeks the destruction of novelty t-shirts, shout “Viva la Flusser!” and leap out of the room. I did it again. The point is, and I know I’m preaching to the choir, I would feel better being over dressed rather than under dressed 10 times out of 10. Let them scoff, you look good. A perfect example of the fact that people in general have lost the idea and art och dressing was this summer. I went to my best friends graduation party, wearing a black two button suit, white shirt with french cuff and a black silk herringbone tie with tiny red flowers on it. I was the only one out of 35 people wearing a suit. Including her parents and brothers. And this is her college gradutation party we’re talking about. I think that there must be balance to reach the perfect cocktail and in dressing is the same. Common sense will give a clue when you are overdressed but most of times is better to be overdressed than underdressed. Dressing is one of the few private pleasures that men can expose without shame and is also a way of expression. And that is the question, what do you want to express? That is the question I try to answer when I choose my clothes. Sorry, I forgot. Thank you for the blog! Well, you can guess what I think. The other folks in the picture looked silly. My apologies to them, but I looked at the photo and it was they who stood out. I live by this rule everyday.